There have been a lot of delightfully fun posts in blogland lately with wonderfully revealing narratives by the blog authors. "7 Strange Things About Me" is one that I particularly like to read. I'm happy to learn that I'm not the only one out there with sometimes quirky tastes. I am adding my own little spin to the lists posted lately. Here are Things I Like. This is a partial list. I like so many things! I just thought you all might be interested in a few. And if we share the same likes, that is all the better! I participated in Missy Ballance's Owl swap. One of my partners is Valerie. Look what she made and sent me! 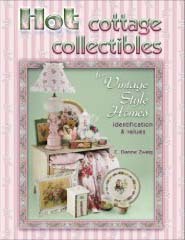 Valerie is a talented scrapbooker and seamtress. She made me the cutest owl oven mitt, and owl shadow box! 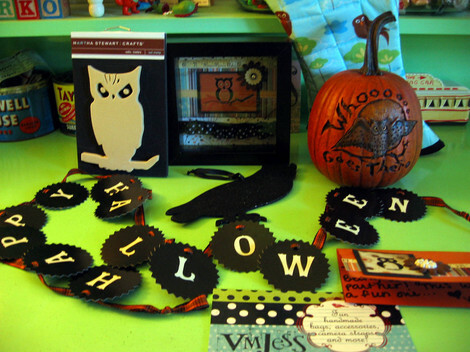 This generouse lady also sent a halloween banner, owl stamp, glittery owl, and wonderful owl on a pumpkin! Thanks so MUCH! XXXOOO! I also participated in Hop Hop Jingle Boo's black cat and pumpkin swap! My partner, Ele, who is a master of the paper arts, sent me this bounty! 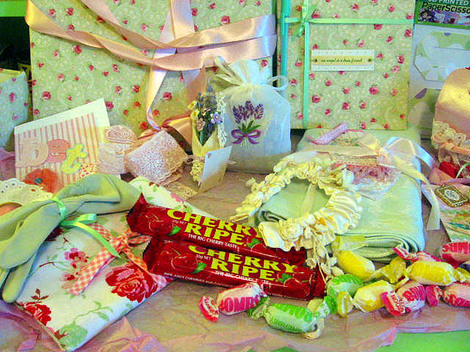 A box and cone, she made from ball trim, vintage images, and MORE, was full of delish candy! 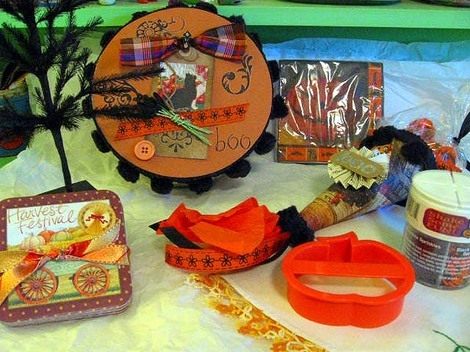 She also included srpinkles, a cookie cutter, napkins, a fab black Halloween tree, a crocheted cloth, and fabulous coasters! What a generous lady! Please visit Ele's blog! Such romantic and pink fun there! Thanks so much, Ele! XXOO! 2. 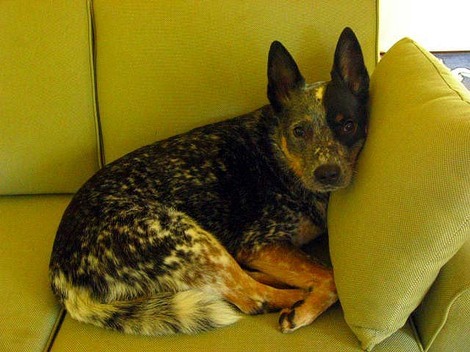 I like my Australian Cattle Dog. Some people think she's funny looking. I think she's cute! She barks a lot and is too smart for her own good. She also likes our living room couch. 3. I like cute things. 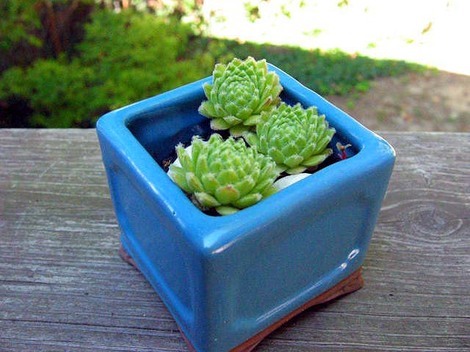 Need I say more about this planter? 4. 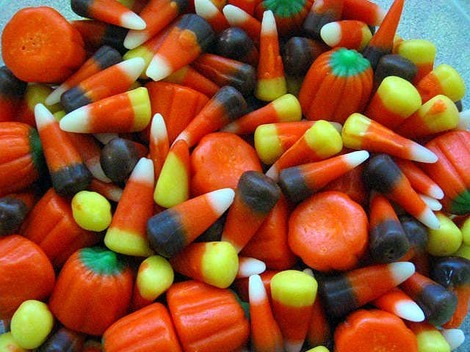 I like candy corn. Pretty, sweet, and 100% sugar! 5. 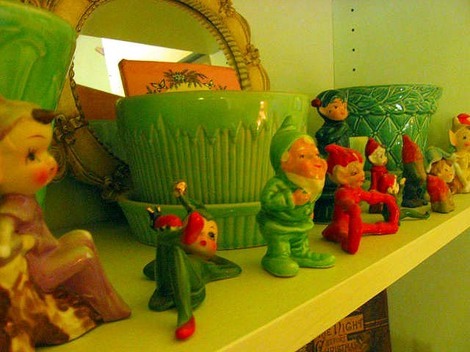 I like my elves collection. Hubby and son think they're creepy. 6. 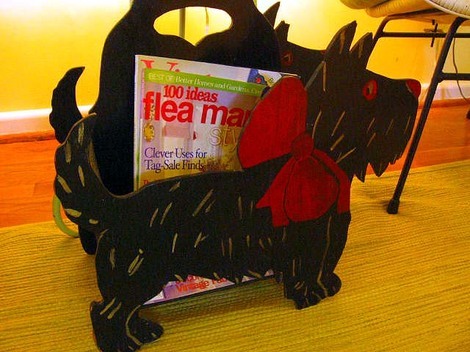 I like my Scotty magazine holder. 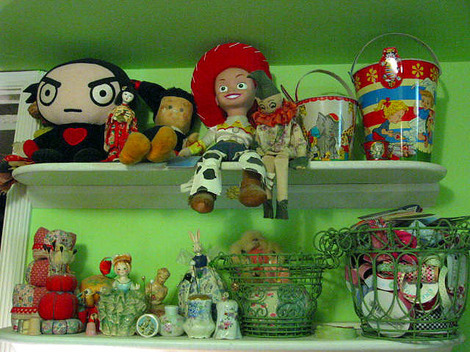 Suzy at GeorgiaPeachez, my BFF, gave this to me two Christmases ago! 7. 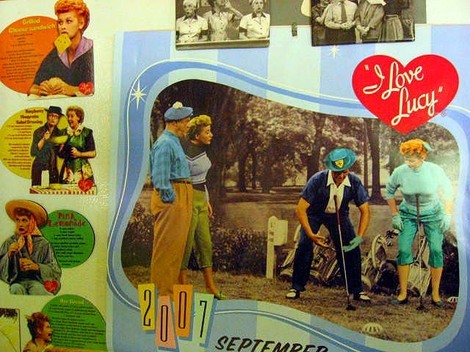 I like kitsch. 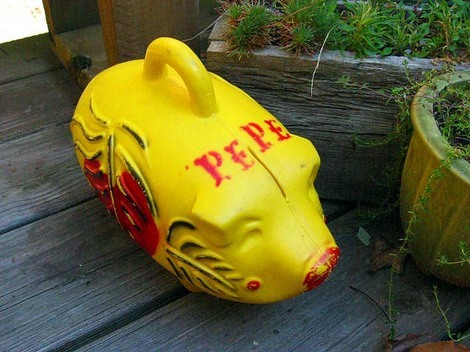 This plastic Pepe pig bank fits the bill and sits on our deck! 8. I like small plants. The shorter, the better! 9. 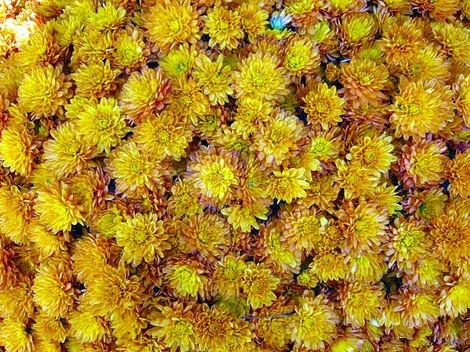 But I also like fall mums. Look at this one! We got it this week! It's HUGE! 10. I like fabric. Lots of it! Here is my stash which I keep in the hallway leading to my office/studio! 11. I like paint-by-number. This is one of many we have on our walls. 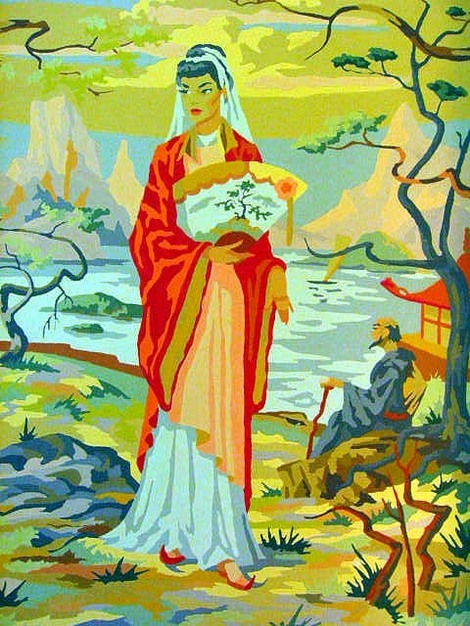 The Smithsonian did a show of paint-by-number a few years ago. What's good enough for The Smithsonian, is good enough for us! 12. 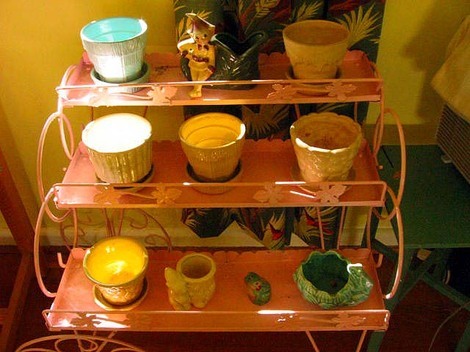 I like my collection of pots, some of which I keep on a pink flower cart. 13. And, of course, I like...I mean I love Lucy! 14. I also like to shop for old things. 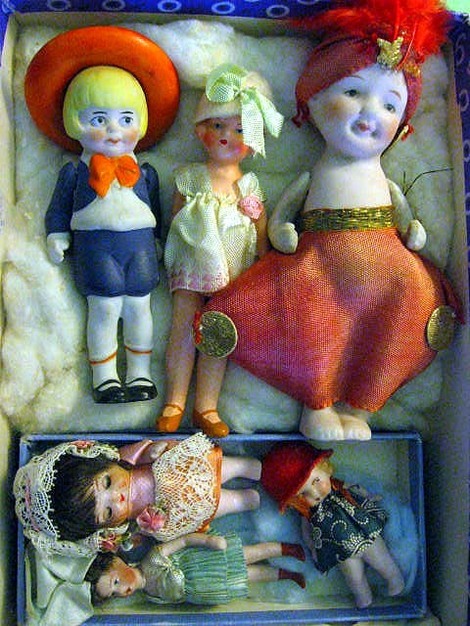 I bought these dolls saturday in a silent auction sponsored by our local church. 15. 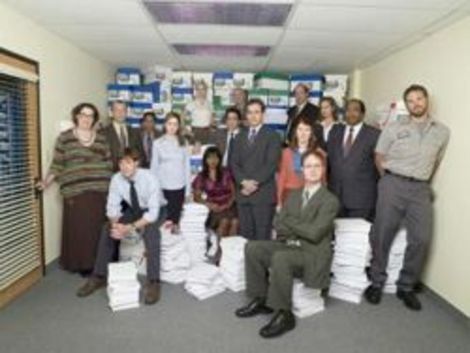 I like The Office. I first saw the British version and was thrilled whe I heard there would be an American version. It is my favorite show! Sometimes my little basement office/studio just isn't vast enough for me to to large-scale creating. 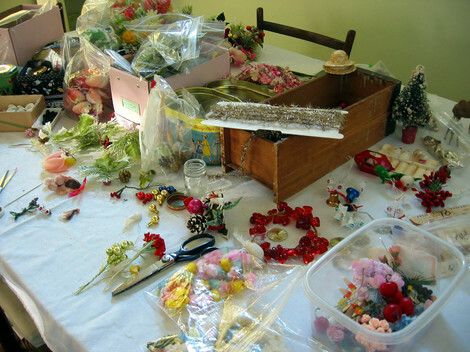 I discovered this fact this August when we were on vacation at the beach house and I had the whole dining room table in which to make my vintage flower and assorted bits corsages. With so much room I managed to spread out and get everything out of the boxes and bags so I could see all of the materials I needed to create. I did the same thing yesterday. 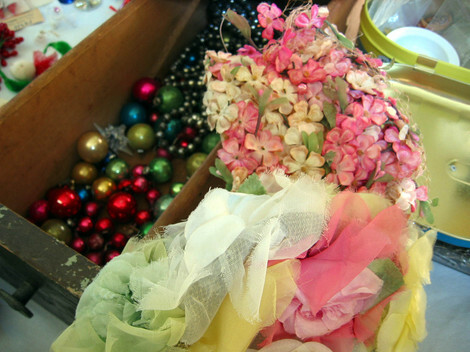 Here is a photographic journey of the fun mess of creation in my dining room. Normally these boxes are stacked neatly or stored in the cabinets of my studio. It looked like they exploded! 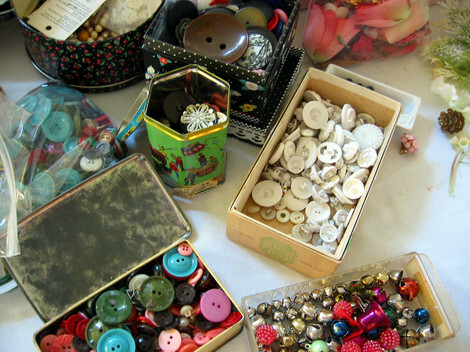 Buttons and bells, oh my! 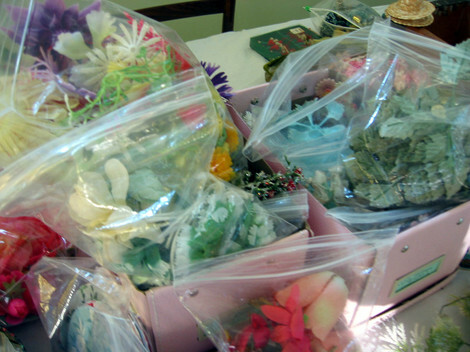 Boxes and bags of millinery and plastic flowers. I got the cute pink boxes at IKEA. Love 'em! 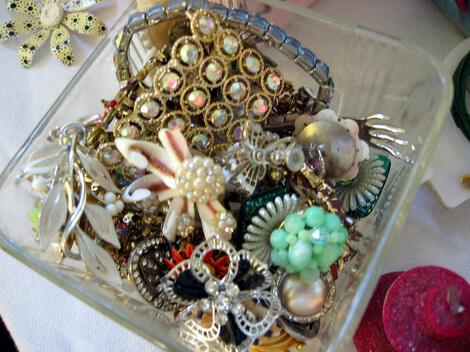 Broken jewelry will find a new life. Two hats loaded with flowers ripe for the plucking. An old drawwer with shiny small ornaments and beads. Bottle brush trees? 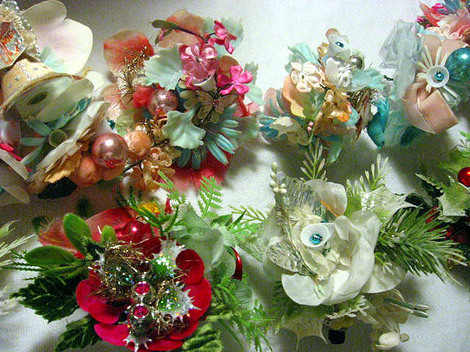 Too big for corsages. 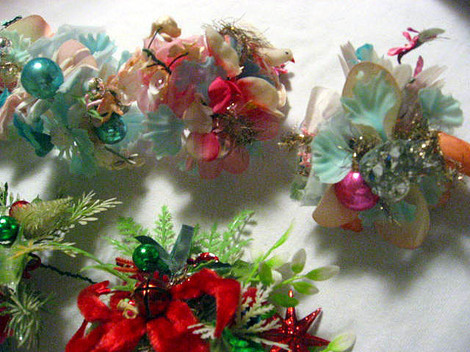 Perhals for pin cushions????? 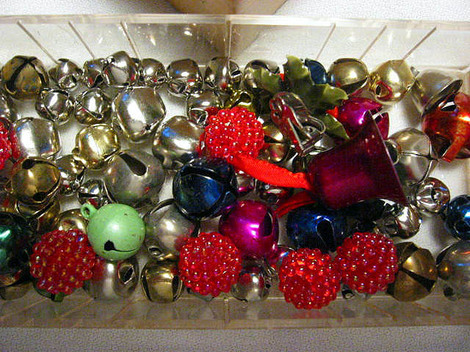 Bells! Shiny and tinkly sweet! 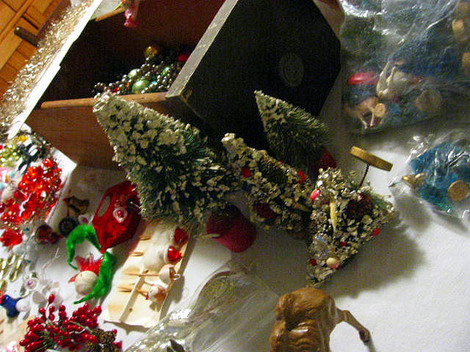 These holiday lovelies still need their back and then they'll be all ready to find new homes. Etsy bound in a day or two. In blogland I meet sooo many nice folks! One of them is the wonderful Pat Sloan! She is a quilter extrordinaire! I am very honored to have made one-of-a-kind totes and pin cushions exclusively for Pat! You may find them here. 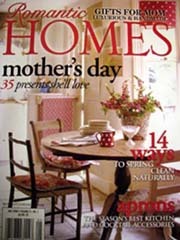 Pat offers many wonderful quilting accessories, her patterns, and fabrics in her on-line store. She also carries fun "girl" items too! Here are a couple of the pin cushions I made for Pat's on-line store! 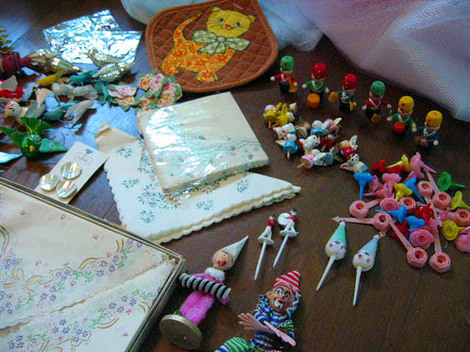 September Big Flea~~Do I Need This Stuff? In my last post I introduced you to a lovely pink wicker and satin glass vanity set that I bought and decided to sell because I don't have a good place for it in my home. Ah, to have a bathroom with decent counter space...but I digress. 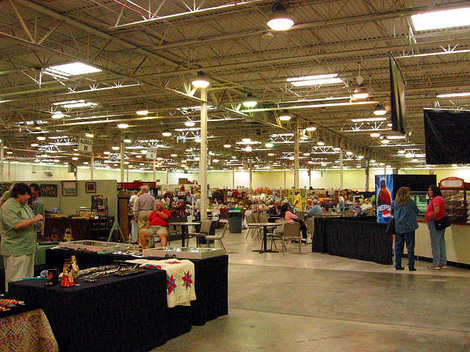 Today I went to the Dulles Expo Center, about 25 minutes away from my house, to the 1100 dealer Big Flea in Chantilly, VA. Here's a bit of the first bldg. 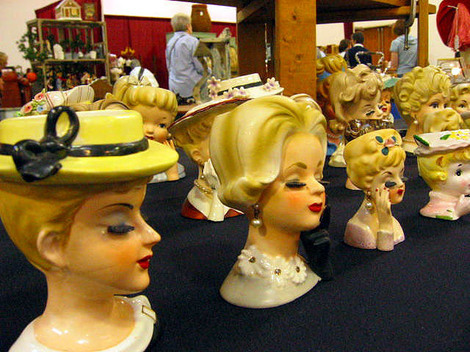 I visited several of my favorite dealers, but I had to take a picture of part of the HUGE head vase collection in the booth run by Violet and John Pammer of Allentown, PA.
Aren't they lovely? 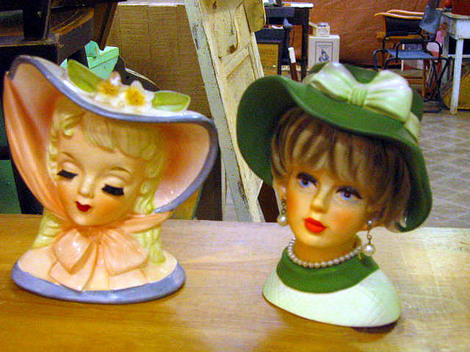 I don't collect these, but I certainly appreciate the demur vintage quality of these pretty ladies! 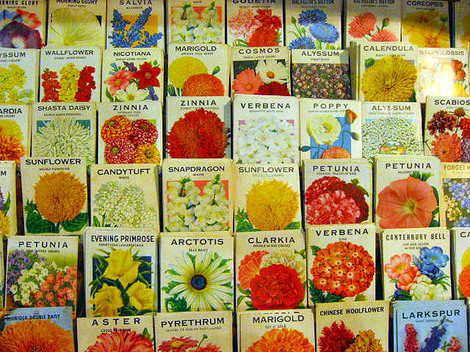 I was immediately attracted to this display of vintage seed packets in a booth just brimming with the most wonderful advertising displays. He was selling them for $1.50 each, but I couldn't think on my feet what to do with them, so I passed for now. 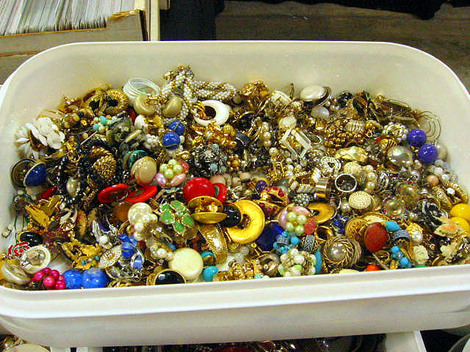 I did stop at this wonderful bin of vintage jewelry, and dug through it carefully avoiding being stabbed by the pins, and found a few pieces. 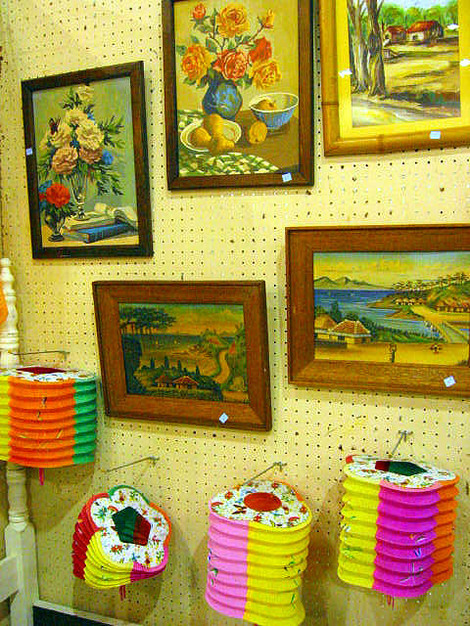 I stopped at this booth with it's high up display of vintage flamingo ceramics. 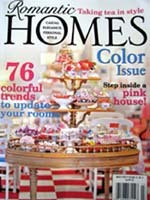 And I love paint-by-number and Japanese paper lanterns! 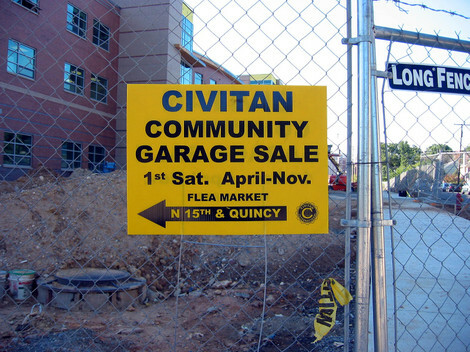 Here's another building of the two that host the Big Flea! In case your were curious, here is my haul. 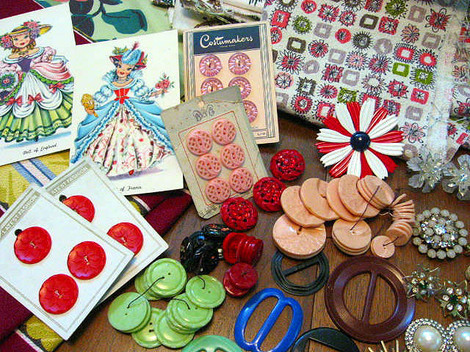 Lot's of fabric, buttons, and costume jewelry to use in my creations. 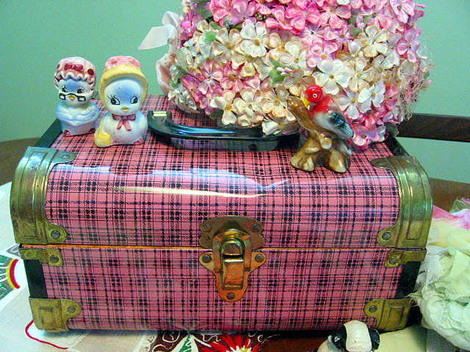 A few figurines, two wonderful hats with loads of flowers, and a wonderful pink and black plaid tin suitcase to store some of my odds n' ends! Musings and Too Much Stuff! 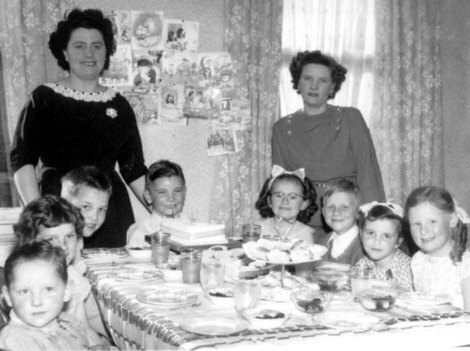 I was surfing through blogland today while eating lunch and took a peek at Allsorts blog. Now I have been recently tagged by my BFF Suzy, among other sweet blogland friends!, for a middle name list. I don't have a middle name. All my life I've felt a little left out by not having one, but there is a good side to it too. In grade school one'e middle name was often a teasing point. so I didn't have to worry with that. BUT I was left out of the recent tag. 12. SPY NAME: (your favorite season/holiday, flower). Isn't this wonderful? 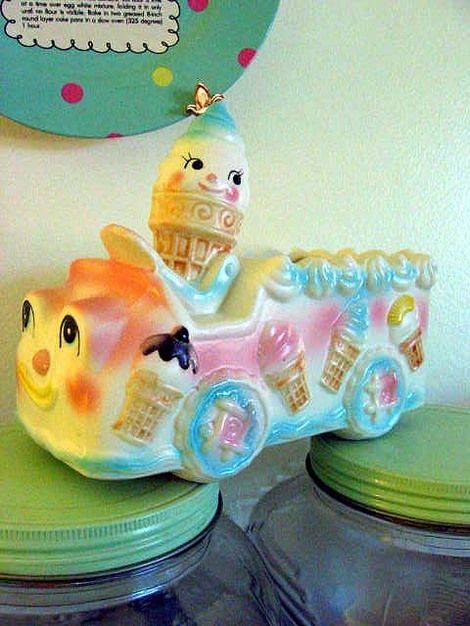 I have a hubby and 13 year old son and if I put this in the bathroom, it would get broken or any number of horrors. Let's face it, there are some fellas out there, and you know who you are, who just can't manage delicate dexterity. So, after enjoying this in my office for a long while, where it really doesn't fit in, I regretably put it on eBay. I hope it finds a good home. Adieu. 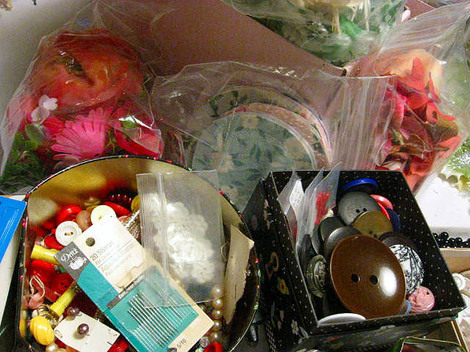 So that tells me that I simply need to just buy things to use in my creations, but I already have lots of that too. And what am I doing this weekend????? 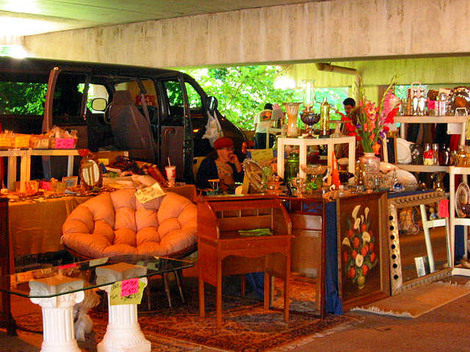 Why going to the Big Flea! 1100 dealers, indoors, awesome! You saw that my BFF Suzy and I went there back in July, and this time I'm going solo to hunt for treasures. I always look for things for Suzy even though she also says she doesn't need anything either. 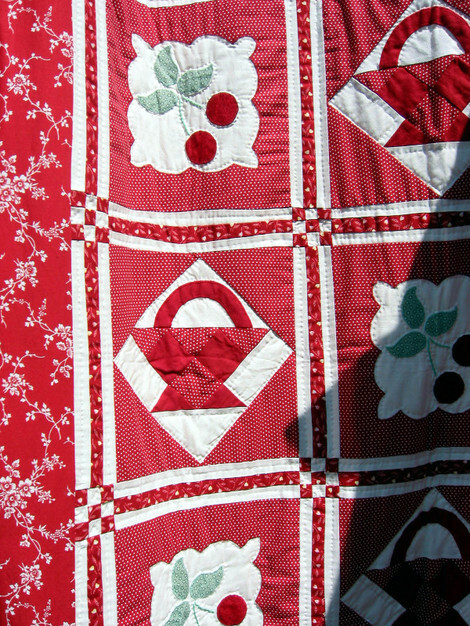 A Fun Sunday Quilt Show~~But I Don't Quilt! 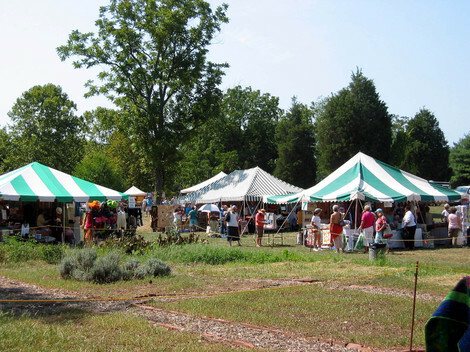 ON Sunday I visited the Sully Plantation Quilt Show and Sale. 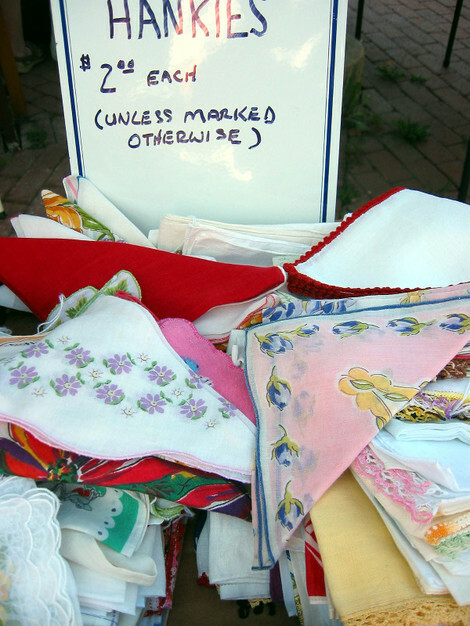 However, I'm not a quilter. 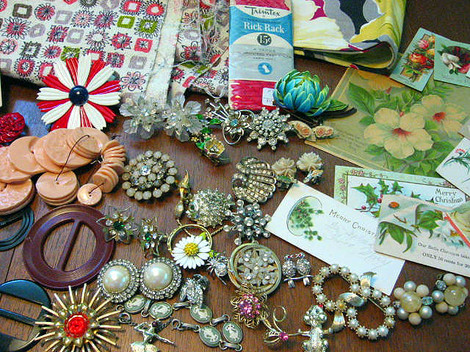 I love this show because many of the vendors sell vintage fabrocs, trims, and buttons! The show is sponsored by the Fairfax County Parks and Recreation and is such a nice outdoor event! The day was warm with a lovely breeze that kept the heat from getting too uncomfortable. 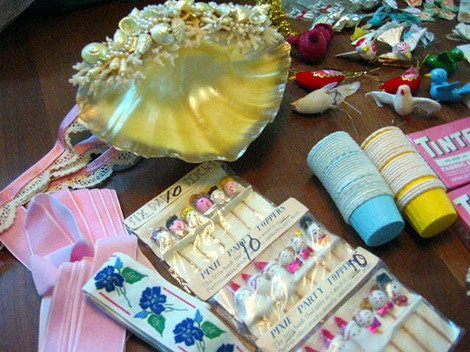 Once admitted to the event, I hurried to my favorite booth run by a pair of lovely ladies who are spectacular crafters and who also sell lots of buttons, trims, and other goodies! As you can see their booth is very popular! I visited it when I pretty much had it to myself. 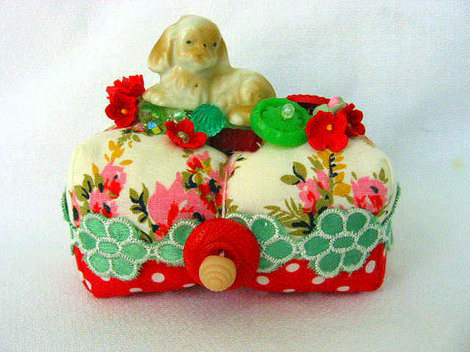 One of the ladies, Debbie Hartwell, makes the most wonderful pin cushions. Her creations can be found at Earth Angels Toys! 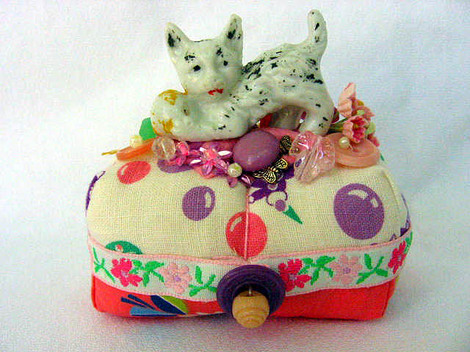 You all know that I certainly can appreciate another pin cushion crafter! Here is my favorite part of visiting this wonderful booth! BUTTONS! 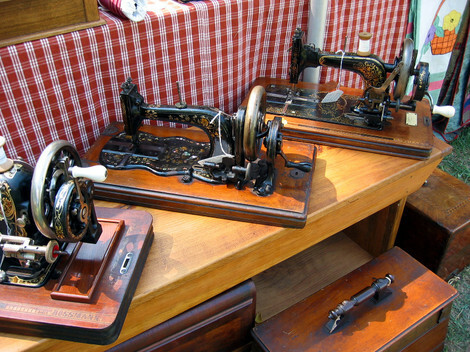 Aren't these vintage sewing machines wonderful? 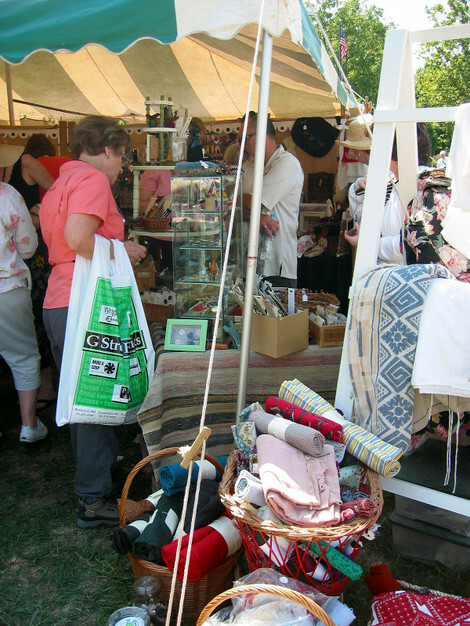 This particular booth deals in very old textiles, quilts, and notions! 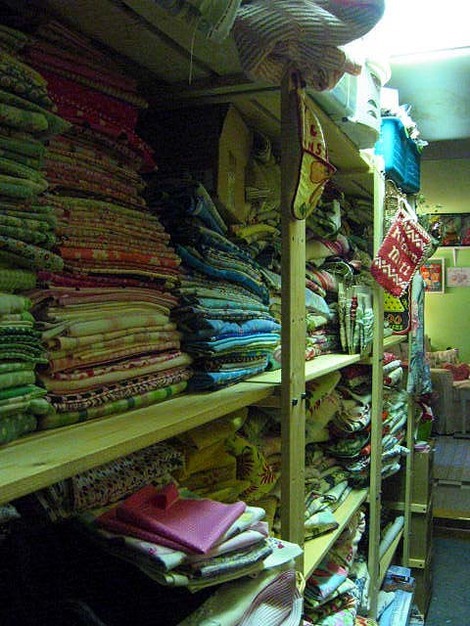 I purchased quite a lot of fabric pieces from these ladies. Everything was priced to sell! 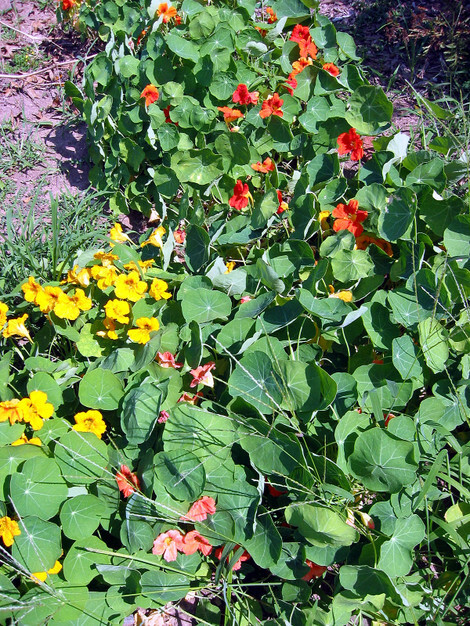 I joust couldn't resist taking a photo of these gorgeous Nasturtiums which grew in profusion in an herb garden on the grounds! 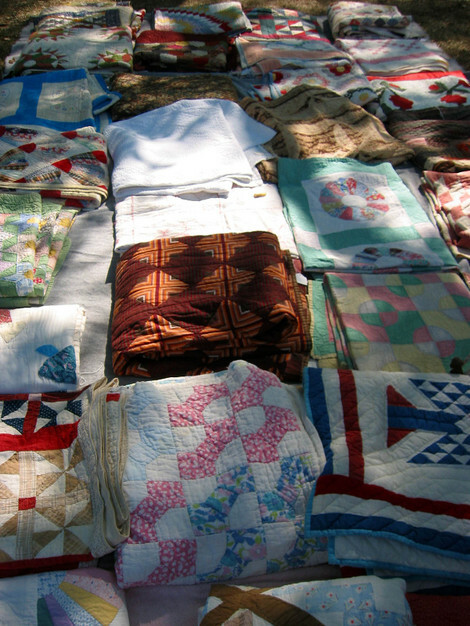 Quilts everywhere! I hobbled out of the sale with a bag stuffed full of goodies! I couldn't wait to get home to sort through them all and start sewing! You all know how that is! 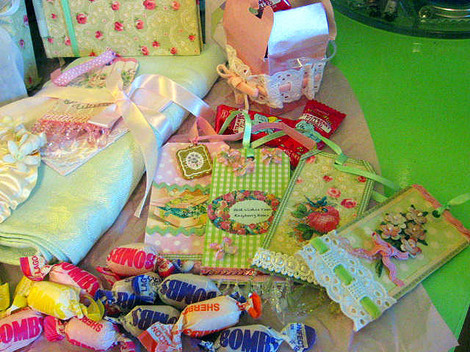 I participated in Shannon's Cotton n' Candy swap! 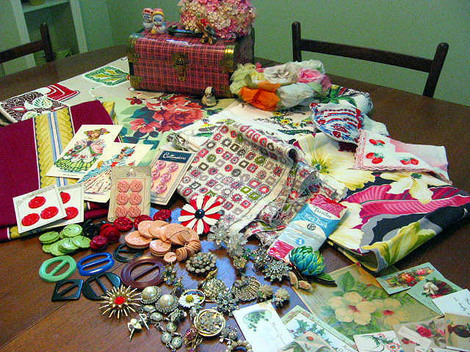 My swap partner is the lovely and oh so generous Linda! She has the sweetest blog, so please take a look! Linda just bowled me over with her beautiful box packed full of delights from Downunder! Linda covered a box with the prettiest pale green and rose fabric! 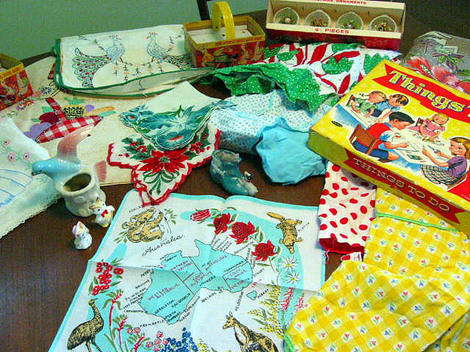 Knowing I adore all things green, Linda sent in this generous parcel! She included the most fruity delicious candy "bombs" and tags she made herself! The details are incredible! A pink box full of Koala chocolates with strawberry filling has already been devoured by me and my boyz! And take a look at this perfectly pape green Damask tablecloth! Pure Heaven! Cherry Ripe candy bars! All mine! I love them! A sweet rosy pillow cover Linda made from the most luscious fabric~~~Divine! A horseshoe with millinery flowers---It now adorns my inspiration board! One my favorite treats were the sugared lavender peanuts! I ate each and every one! And if that weren't enough, LInda included the perfect pair of pale green gloves~~~They fit! 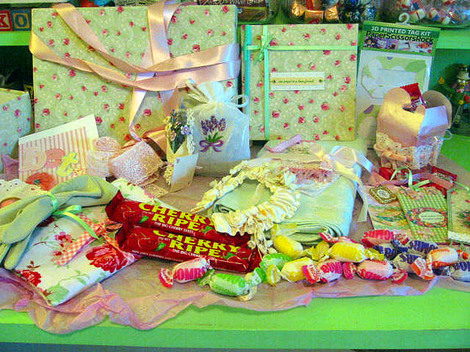 Linda also included in this overflowing package of sweetness, a journal she covered in the same pretty green roses fabric! 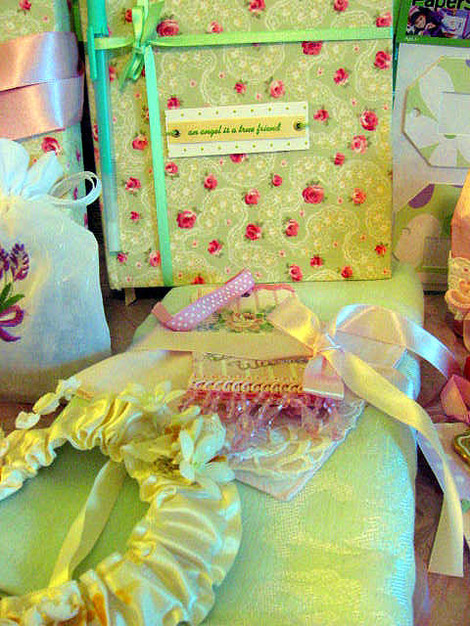 LIttle spoolks in pastel shades, a sweet mini tussie mussie, and snippets of lace complete this wonderful swap! I am so so very lucky to have met and swaped with Linda! Thank you so much! XXOO!!!!!!!!!!!! Please Join Me in an Office/Studio Tour! 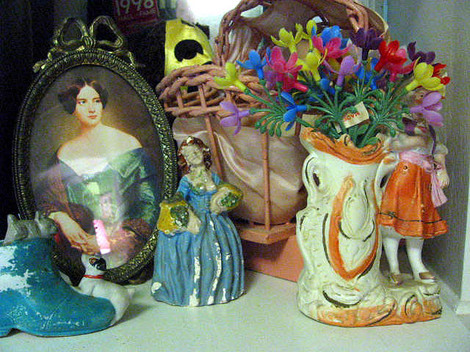 Here is one corner of my desk. 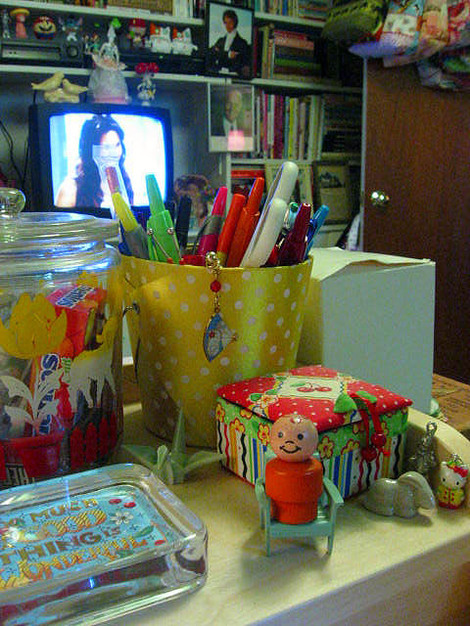 I love my little Fisher Price man, and my glass jar of candy! Notice the TV in teh background. It's on one of my fave shows: Top Chef! 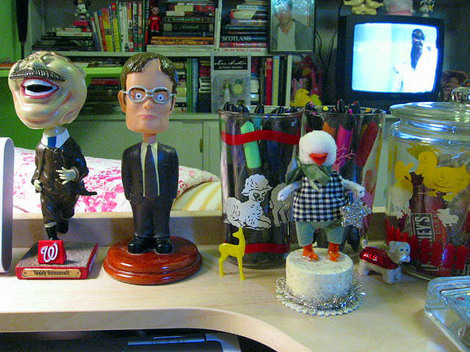 Here are my two bobbleheads: Teddy Roosevelt from the Washington Nationals baseball mascot collection given away on Labor Day AND Dwight Shrute from "The Office"--my fave show! 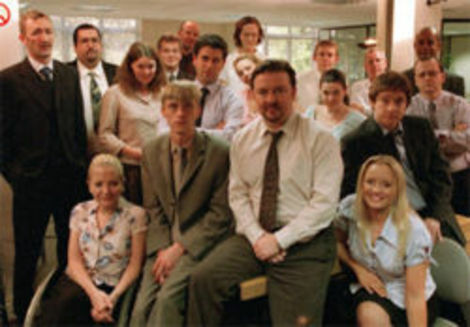 I love the BBC version too! Also there is a cute chick from the Jennifer Murphy collection! 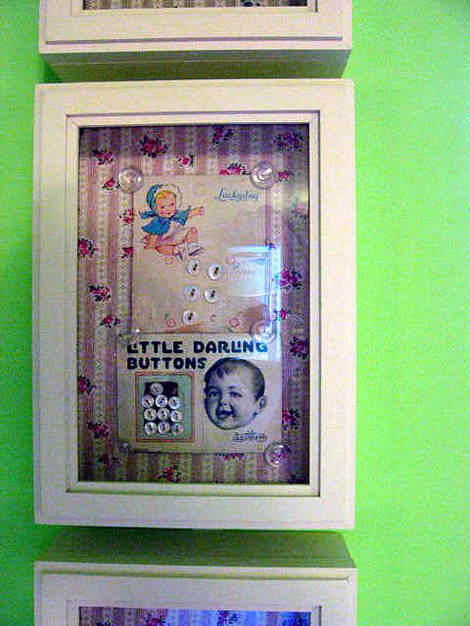 The little box hold wishes! 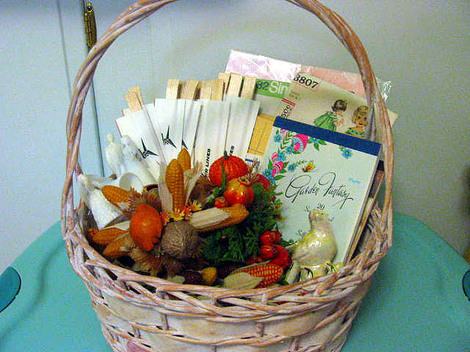 Here's a basket sitting on a plastic tub with totes planned for an upcoming trunk show (more about that later!). 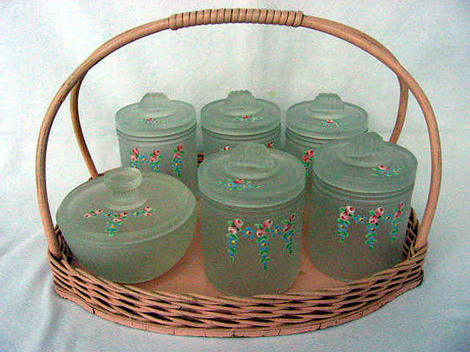 The basket is full of recent thrift store finds! A vignette of shabby ladies and one dog and kitty on a shoe. Waiting on deck to be made into futire projects! The pink wicker crib behind them once held flowers given to my mom when I was born. 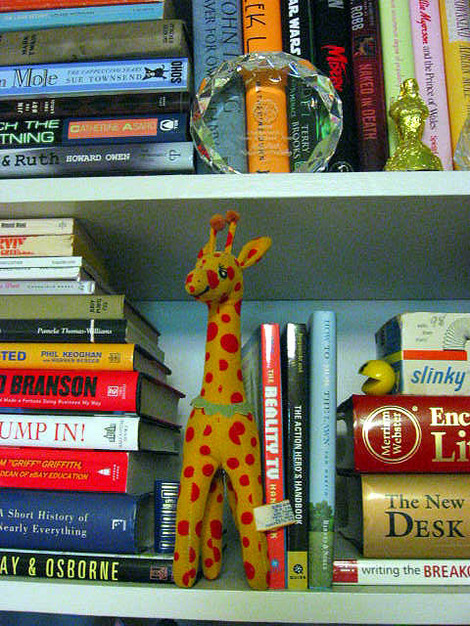 A section of my bookshelf with a favorite girrafe Dream Pet--Love the dots! A Pac Mac my son gave me. A slinky from childhood. Lots of research books for my writing AND a lovely crystal glass service award from Washington Romance Writers! 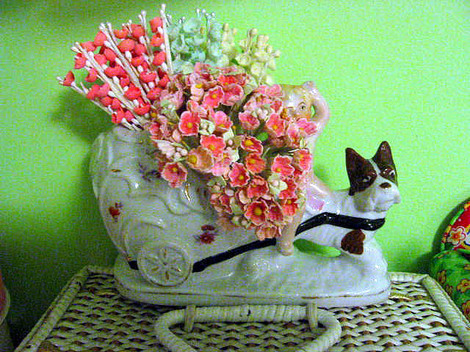 A funny terrier pulling a cart vase holds vintage millinery flowers I purchased from the delightful Heather at Speckled Egg! 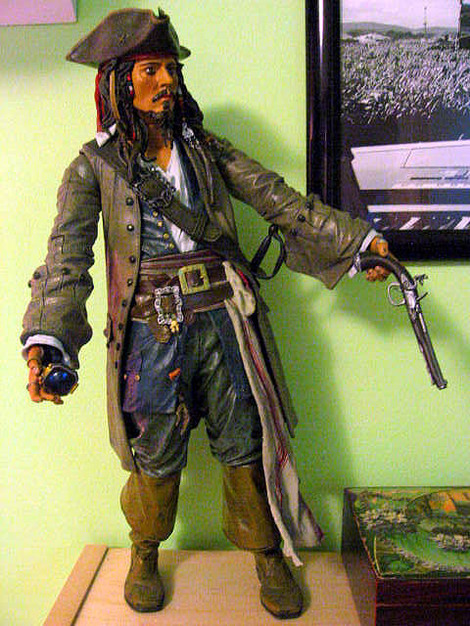 Captain Jack Sparrow keeps watch over my space! Hubby made these sweet shelves which hold all sorts of things from my childhood (and adulthood! 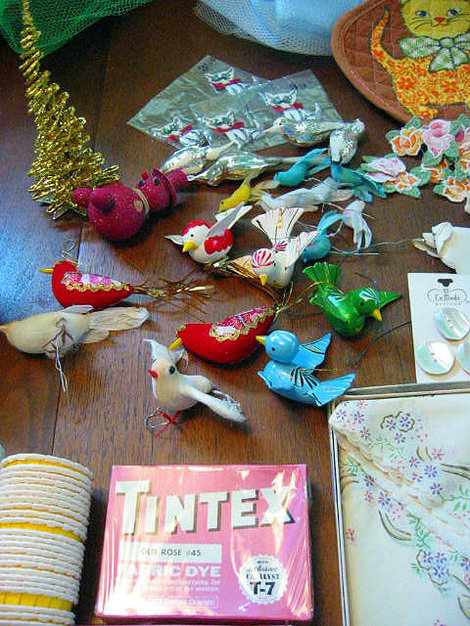 ), as well as metal baskets of ribbon and trims! 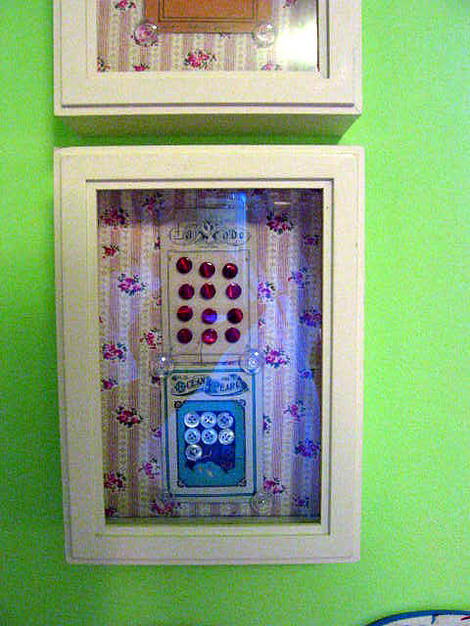 One of four shadowboxes with my favorite button cards! 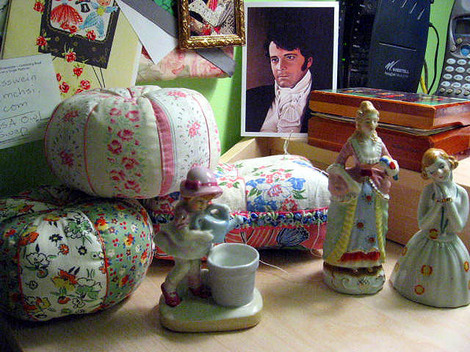 Another corner of my desk with three pin cushions in progress. They'll eventually end up on my etsy shop! A card with the perpetually yummy Colin Firth as Mr. Darcy sent to me by my good friend and neighbor, Molly, who was touring the United Kingdom before heading off to music school in Hungary! 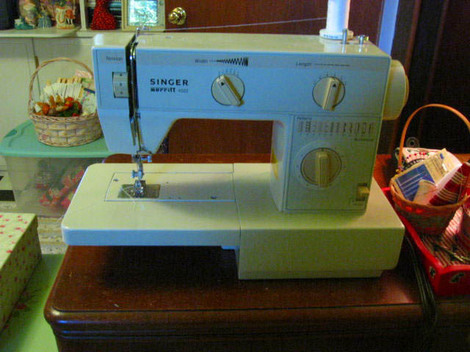 My old faithful Singer sewing machine! She had a recent overhaul and works like a little champ now! A girl has to have a nice place to relax! 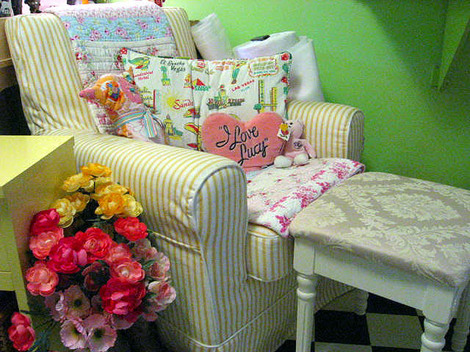 My pillow-filed chair with Simply Shabby Chic vanity stool to rest my feet is the perfect place. A pair of cowgirl boots I bought in Cody, Wyoming make a sweet flower holder! Now, if I could only convince hubby, son, and cat that this chair is MINE! 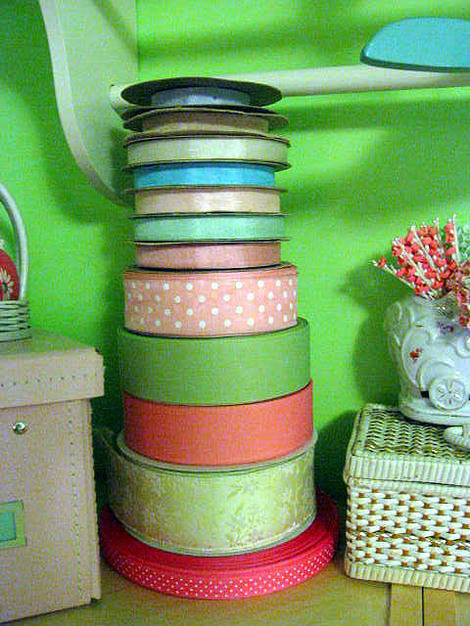 Stacks of pastel seam binding and ribbon bought by the spool up in Hagerstown, Maryland at the Offray ribbon outlet! Suzy might be, but is not, the girl with the bow and glasses. How old is Suzy? Well...Suzy can tell you what she was doing when Neil Armstrong walked on the moon. She can also tell you what life was like before cable TV. I bet Suzy owned lots of records too, and quite possibly a metal lunch box to take to school. She is my BFF and I wish her a very happy birthday! 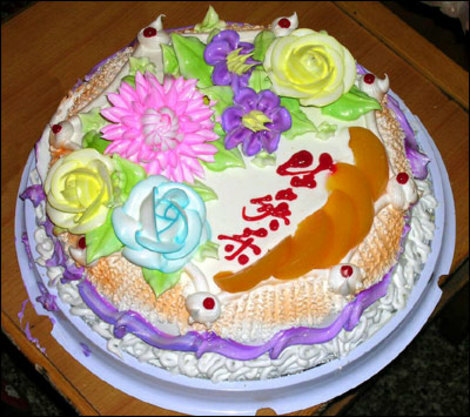 Please go visit Suzy's blog and wish her a happy day too! We spent today (saturday) doing fun Labor Day holiday weekend things! 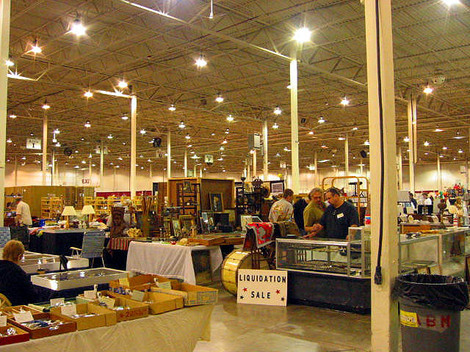 First thing this morning, hubby and me went to the Arlington Flea Market just outside of Washgington, DC. 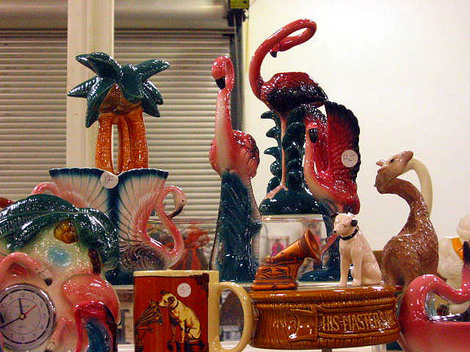 The flea market is a lot of fun, free to get into, and full of great vendors. 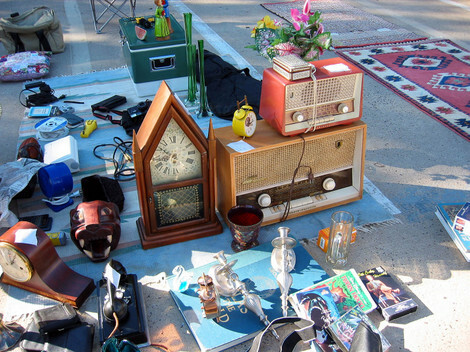 Some of the vendors are outside on top of teh parking deck, like this vendor who has a couple of cute vintage radios. Hubby doesn't usually go to flea markets with me, but he gave in this morning. He actually looked at some things and bought a pair of corner clamps for $3. He's very happy about his purchase. Can't you tell? I visited a vendor down under cover in the parking deck. 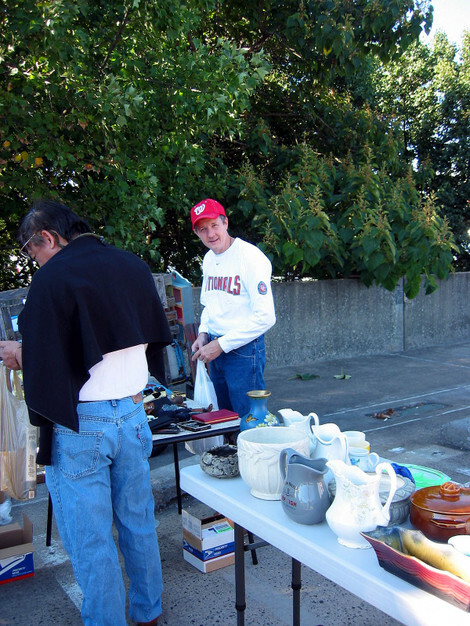 He said he was moving to Florida and he was selling everything cheap! 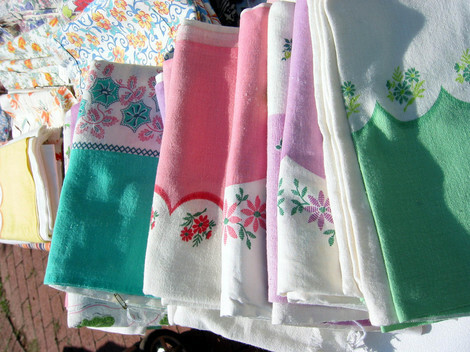 I bought a nice assortment of vintage linens from him for $1 each. 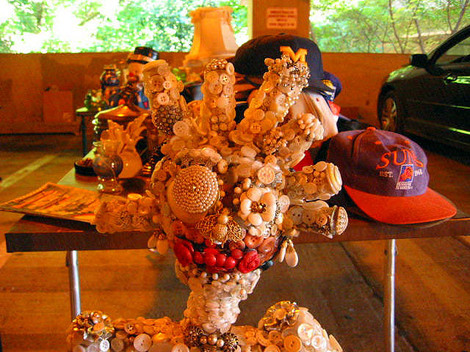 One of the vendors, a lovely lady named Diana Gamerman, who has a talent with many media, but what attracted me was this wonderful sculpture she had created with thousands of buttons and jewelry bits and pieces! Diana said this piece wasn't for sale, unless someone gave her the "right price." 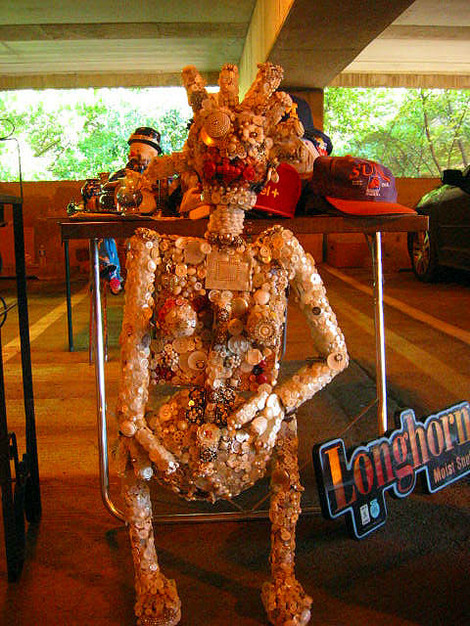 It is just a mascot for her selling area to attract customers like me! I bought a wonderful vintage coloring set from her booth. 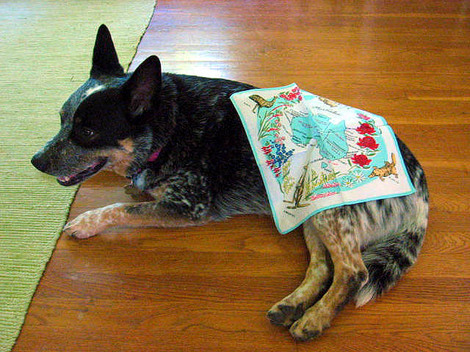 Our Australian Cattle Dog especially likes the souvenir Australian hankie I bought! She's really saying: "Get this thing off of me before I tear it to bits, now give me a treat!" 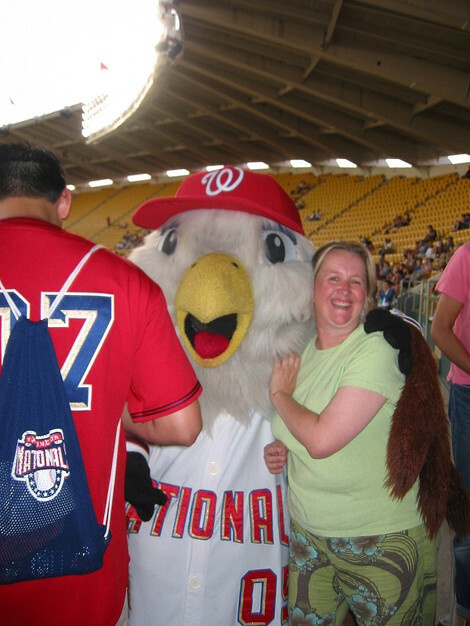 Saturday night, we went to RFK Stadium in DC to see the Washington Nationals play the San Francisco Giants. It was a nice evening, and everyone got a free bobblehead doll of President Teddy Roosevelt. Not only did I get a bobblehead of one of the four presidential mascots, I managed to sneak in and get a picture made with them. Only one, and of course, I was too distracted to actually bother to smile. Instead I chose to look like a crazy person. 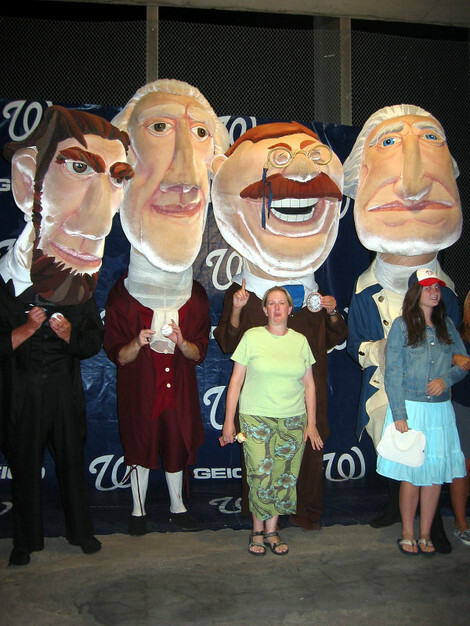 These presidents race in the middle of the fourth inning. Teddy, for some reason, never wins. The Nationals have another mascot. It's Screech. 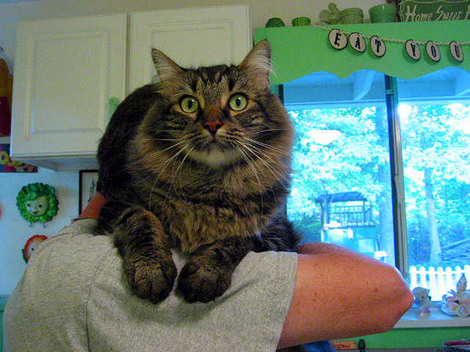 Screech is essentially a fat baby eagle. He was walking by where we were sitting. He grabbed me and hubby snapped this picture. Again, I look like a crazy person grabbing back at a giant routund eagle.